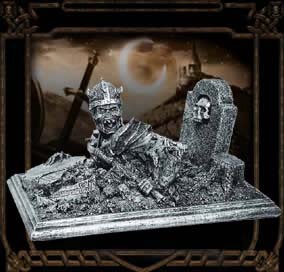 Projekt X is a brand new range of highly detailed 1/48th scale (36mm) pewter figures set in a Science-Fiction horror alternative history of the Second World War. 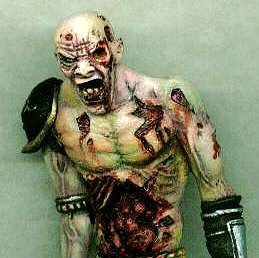 This is a sister company to North Star figures and the range includes some WWII zombie figures like a zombie battle pack (5 minis) and a few undead characters. 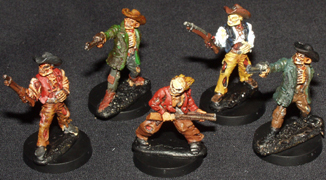 Pinnacle makes miniatures for their Deadlands and Great Rail Wars games. The setting is the Weird West, an alternative fantasy setting for the old west in the days of he American Civil War. In the weird West the dead don't always stay dead, and more than one unfortunate gunslinger wakes up to find himself one of the Harrowed, which for our purposes can be described as zombie cowboys. New company producing mainly zombies. The first ones are a bit less than we're used to, but the second batch, sculpted by Drew Williams, looks a lot more interesting . These are present day zombies, not undead medieval rabble. As well as producing their own miniatures, this manufacturer has picked up several older lines and is the UK-distributor for many more ranges. The zombies, like much of Amazon's ranges, look dated, but since they are supposed to be zombies (as in decomposing, twisted, horrific parodies of living humans), it's a bit more tolerable than for other subjects. French manufacturer of large scale resin "statues" that can be painted up to be giants in your wargames armies. 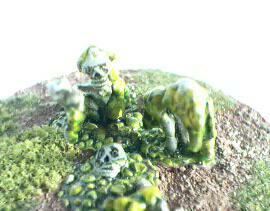 The range currently includes a zombie rising from the grave. Okay, so maybe he won't loom over the battlefield, but he would be quite tall once he got out of his grave. 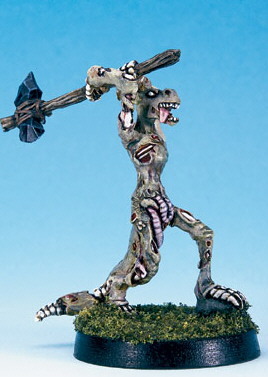 Slap some paint on it and voila, instant zombie giant. These models may be a bit costly, but then again, so would any other miniature of this size. 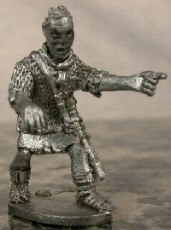 Essex makes a large range of historical models and some fantasy models. Some of their ranges are decent enough rank & file models, while others are barely shaped lumps of molten lead. The zombies fall into the latter category, so I won't bother showing them here. Australian manufacturer with one of the most diversified miniature catalogues I've ever seen. They already figured in most of our other showcases and we can rely on them for some original miniatures this time over. 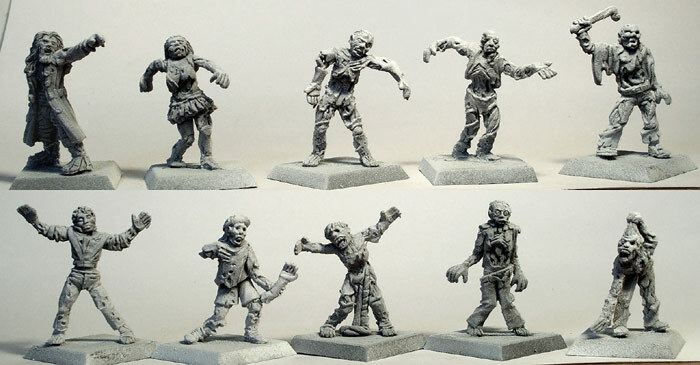 Eureka miniatures produces zombies in their "Pirates" line of miniatures. These are zombie pirates (of course) and zombie pirate conjurers in eastern or Hawaïan dress. Picture courtesy of private Fatgoblin (Thanks again). The former manufacturer of classic AD&D and promising Chainmail ranges, now venturing in the godforsaken realm of prepainted, randomly packaged, plastic crap because apparently that's what we really want to spend or money on... 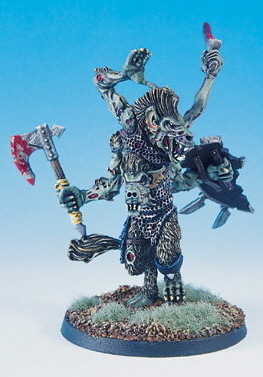 But I digress, what I really want to say is that the defunct Chainmail, still available from many places, carried some unusual zombie figures, like a zombie minotaur, a zombie gnoll with extra limbs and a zombie troglodyte. Mortis Ambulo, the Dead walk amidst the ruins of the Roman Empire. This pack contains 8 zombie bodies, and an assortment of heads (both helmeted and bare), and some arms. Like snowflakes, no two zombies are alike. Make up a zombie horde by mixing heads and arms, and making slight bends to the arms. The figures are 28mm and sculpted by Tony Aldrich to represent historically accurate Roman zombie legionnaires.